It’s been a pleasure working on this project with Colin. Colin was able to quickly grasp the characteristics of our target audience, and adapt tone, style and content to fit both OCSI’s organisational brand as well as the needs of the audience. I wouldn’t hesitate to collaborate with Colin again. To raise awareness of Local Insight as a source of small area data on housing affordability issues. To promote the benefits of small area data for supporting evidence based decision making to business intelligence practitioners. To promote the benefits of using the right data, tools and techniques as an innovative solution to meet demand for insight now and in the future. To raise awareness of the benefits of data visualisation to engage the policy making audience and promote the value of research and intelligence. Small area data on the affordability gaps of entry level and averagely priced housing were analysed in data visualisation software. 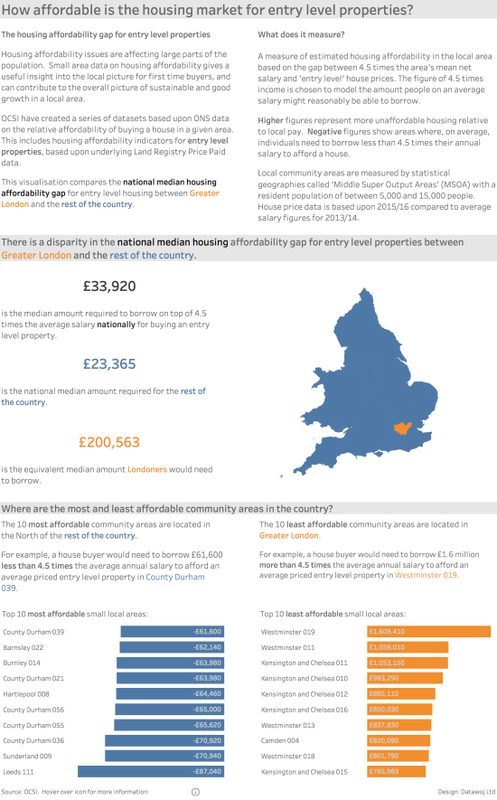 Creating bespoke data visualisations of small area data about the housing affordability gap for both entry level and averagely priced housing within England and Wales. Writing a 2-part blog post promoting the benefits of visualising small area data to help balance demand for insights and raise awareness of the value of research. The blog post and visualisations were targeted at Business Intelligence practitioners through direct emails and online social media campaigns. Increased awareness of the Local Community Intelligence Tool amongst the Public-Sector Business Intelligence community as demonstrated by 2 requests for demos following the mailout. Raised awareness of the benefits of the right data, tools and techniques to provide quick and accurate insights to help balance the demand for insights now and in the future as demonstrated by 160 views of the blog within the first 3 days. Raised awareness of how data visualisation can help engage the policy making audience to promote the value of research and intelligence. The first data visualisation focusses upon the housing affordability gap based upon comparing the average income and the median house price for entry level housing across local community areas. It compares entry level housing affordability in Great London to that of the rest of the country. The first part of the blog, can be found on the OCSI Website. 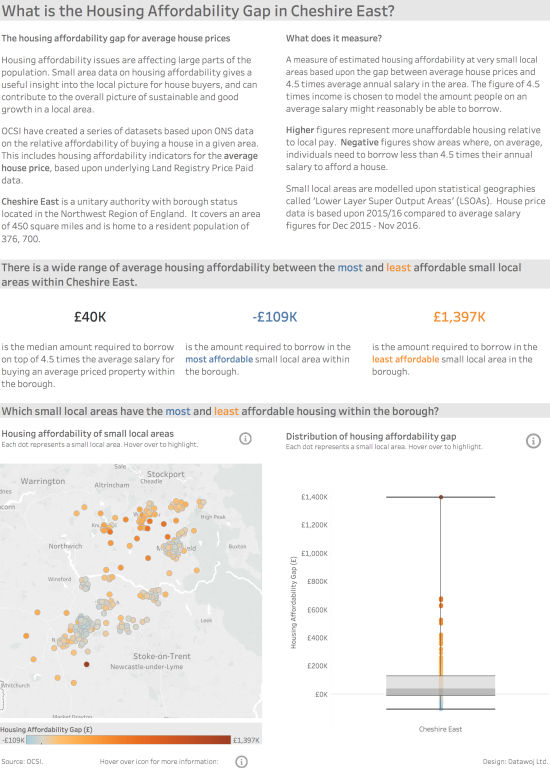 The second data visualisation focusses upon housing affordability based upon comparing the average income and average house prices for very small areas in Cheshire East. The second part of the blog, can also be found on the OCSI Website.